Rehab Medical Update Medical News on time ….we are supplier of medical equipment in china. Big explosion accident happened (12th Aug,2015)in a cargo port where located in TIAN JIN . this has caused 123 people dead more than 100 people got injury. Up to now, many hospitals have been admitted to inpatient injured injury basically under control, gradually entering rehabilitation phase, many of the wounded have been discharged from hospital after another. In order to strengthen the work of rehabilitation and rehabilitation after discharge during the wounded in hospital, Tianjin arrange not only the county primary health care institutions continue to do the work of the hospital rehabilitation treatment of the wounded, but also to mobilize the city’s municipal rehabilitation expert group of experts was established, and with the tertiary care institutions rehabilitation medical capabilities, to provide professional rehabilitation medical security for the wounded. 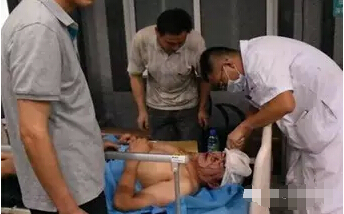 In order to strengthen the work of rehabilitation of the wounded to live after discharge, Tianjin issued the accident was discharged back to community treatment and rehabilitation of injured emergency notification, to meet the conditions and have been discharged from the hospital, but also in the community to take care of the wounded, according to the principle of territorial management area from primary health care institutions to connect with, good connection wounded discharged rehabilitation treatment. For mobility, need home rehabilitation of the wounded, provide Songyisongyao, rehabilitation guidance and other home services, to achieve the discharge of the wounded and the grassroots medical institutions seamlessly. Community health services will take the initiative to contact with the wounded, asking their injury recovery, does it feel after discharge have physical symptoms like; in helping the wounded treatment of wounds, dressing, it will also ask whether their wounds still ache, explain when activity, etc. precautions during exercise. Further, the Binhai New Area of the community health service institutions also open a green channel to ensure that the number of health care workers in the post, at any time there is a need to provide treatment services wounded. At the same time protect the wounded community rehabilitation, Tianjin will also use medical rehabilitation hospital capacity cranial nerve Lake rehabilitation, acupuncture and physiotherapy First Affiliated Hospital of Traditional Chinese Medicine, Tianjin Hospital orthopedic rehabilitation tertiary care institutions, for the corresponding wounded follow-up rehabilitation work, so that “there are institutions, there are people, there are arrangements”; mobilize the city’s medical rehabilitation experts in the field of rehabilitation expert group set up municipal professional will cover nerves, orthopedics, Chinese medicine physical therapy and other professionals, provide for the different needs of the wounded guidance and rehabilitation treatment, to ensure that the wounded were from the treatment to the whole process of rehabilitation can get professional medical care. Unified arrangements of the city at the same time, reporters from a number of hospitals to understand the various hospitals have also according to their characteristics, to carry out rehabilitation of the wounded and guide our work. A central hospital has begun to burn treated the wounded rehabilitation guidance and training, burn the person responsible for the wounded evacuated to develop targeted rehabilitation programs; hospital follow-up center, but also at any time post-discharge follow-up to the wounded, according to the individual needs to provide rehabilitation guidance. Five centers for the wounded hospital staff repeatedly each day to conduct a comprehensive physical examination, targeted to help the wounded to carry out functional training, minimize their disability rate, and improve the quality of life. It is understood that the wounded were treated in hospitals with severe injuries to each person according to the medical treatment of a full treatment plan, rescue expert group set up for every seriously wounded, to maximize the speed of the rescue, but also for every wounded have implemented one person a file, a detailed record of the diagnosis and treatment course and results since the wounded to hospital. Archives, not only marked the wounded basic identity information, but also according to the chronological record of the wounded were injured, the main symptom characteristics and development changes, associated symptoms, diagnosis and treatment course and results of the change, sleep and diet in general after the injury; for crush injuries, blast injuries, burns, and other critically ill patients with combined injuries, but the injury depends on the change to keep records, and to take timely and targeted therapies. Through injury records and clinical observation, analysis, analyze each casualty trends injury, so be judged in advance, early intervention, treatment as soon as possible. Gunagzhou Rehab Medical offering durable and low price rehab medical equipment to the world..